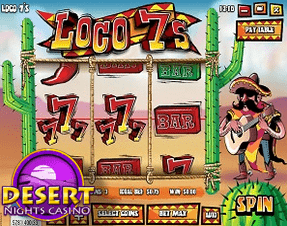 Rival Gaming launches Loco 7's, a simple and strange yet addictive new slot set beside a lone mariachi player among the sands and cacti of Mexico. With so many amazing games in their lineup and great partners bringing their games to the gambling public, Rival Games has gone back to the roots of slot gaming with the three reel, single line Loco 7's. Starting on March 30, 2015, a stranger clad in a poncho, a sombrero, and spurred cowboy boots plays mariachi music along with your spins, accompanying your desert adventure across the single pay line. Symbols in the game include the classic Bar, the titular Loco 7's and different types of chilli peppers that really turn up the heat, as if the desert setting weren't enough to make you reach for a tall glass of water. An adjustable bet amount for each spin makes this an affordable game for new and timid players and exciting for those who like to take more risks in order to reap bigger rewards. To celebrate the new arrival, Desert Nights Casino is holding a welcome bonus for new players to try it out. The special deal includes up to $500 added to your bank roll through 100% deposit matching, so long as your investment is more than $25. After you've taken advantage of the match bonus, $50 in free play is also up for grabs. Not to leave out the regulars while treating the newest recruits for their casino's membership, Desert Nights is also offering extra cash to any and every player through the whole site. 177% deposit matching is available for anyone who puts in more than $25 and is only capped at $500 and with a play through requirement of 32 times of the combined deposit and bonus. Available only until April 5th, 2015, this offer is drying up quickly so grab it today!